You’ve probably heard that no two individuals with autism are the same, and while this certainly contributes to the uniqueness of autism spectrum disorder, it can make things extremely tricky. The internet is filled with all kinds of tips and strategies for improving speech, encouraging age-appropriate socialization, teaching proper self-regulation, managing aggressive behaviors, and coping with anxiety, but the things that work for one child may not work for another, leaving parents and caregivers stuck in a never-ending cycle of trial and error. And since behavioral issues with autism can be pretty extreme at times, figuring out how to discipline an autistic child appropriately is a challenge that leaves many parents feeling overwhelmed and desperate. Of course, there is never a shortage in opinions on how to parent an autistic child, but unless you live in the trenches of your specific situation each and every day, it’s difficult to understand that traditional forms of discipline and punishment may not be effective. Your child may not be able to make a connection between her behavior and the consequences you are trying to enforce, making any and all forms of punishment frustrating and, quite frankly, useless! 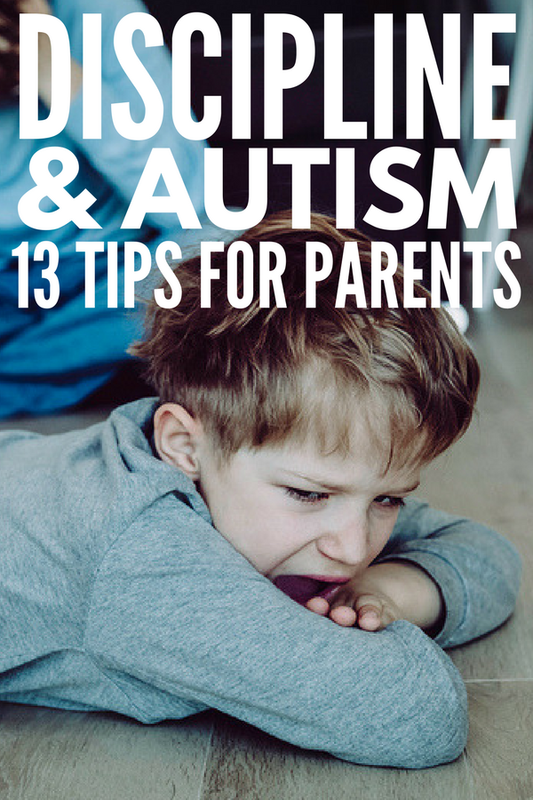 The good news is that disciplining an autistic child is possible, and we’re sharing our best ideas to help you figure out the best strategies for you and your family. Is it autism or just bad behavior? When it comes to figuring out how to discipline an autistic child, it’s important to determine if the behavior you are witnessing is a result of the autism, or if your child is in fact misbehaving. As you can imagine, this isn’t always an easy thing to do, but there are 2 tools you can use to make an accurate assessment. The idea is to track the same behavior multiple times to determine if there are any consistencies, and then formulate a plan to change the antecedent and/or consequence to ensure the poor behavior is extinguished. You can also use this tool to determine if the antecedent and/or consequence is out of your child’s control (i.e. sensory sensitivities) or if your child is just being a kid and acting out. If you’ve never heard of this approach to behavior, it’s quite fascinating. According to this theory, the poor behaviors we see in our children are only the ‘tip’ of a much bigger iceberg. And since only about 10% of an iceberg is visible to the naked eye, it is theorized that the drivers of our child’s behaviors live beneath the surface, and that we must find a way to see and understand these drivers before change can occur. Using an ABC chart to track the things that occur before and after your child’s behaviors, and making a conscious effort to dig deeper into the ‘iceberg’ of her behaviors can be life-changing when it comes to parenting a child with autism. Of course, tracking behaviors once will not be enough. You must observe and record a single behavior multiple times before you can determine if it’s autism or just bad behavior, and while this can be time-consuming and frustrating, you will be amazed at all of the things you will learn about your child along the way. You might find yourself making connections with and understanding other behaviors, and figuring out ways to avoid tantrums and meltdowns before they even occur. 1. Choose one behavior to work on. When we reach our breaking point with our child’s behavior, we tend to go to the extreme. We want to fix every single behavioral issue RIGHT NOW, and fail to remember that change takes time. If you want to know how to discipline a child with autism effectively, you need to pick one behavior to work on at a time. Take 5-10 minutes to write out all of the things you and your child are struggling with and circle the ones that disrupt your child’s day the most. From that list, choose the behavior that puts your child (or others) at the most risk, or the one that causes the most challenges and disruptions in your daily routine. 2. Identify the WHY behind the behavior. As discussed above, using a combination of an ABC Behavior Chart and the Iceberg Model can help you dig deep and get a better understanding of why your child is behaving a certain way. While time-consuming, knowing the WHY behind your child’s behavior is extremely important for effectively rectifying behavioral issues with autism, especially in cases where the child in question struggles with verbal communication. 3. Always have a plan. Taking the time to evaluate and understand behavioral issues with autism is one thing, but coming up with a plan of action is something entirely different. Once you know what triggers certain behaviors in your child, put a plan in place and stick to it. For some, this may be as simple as keeping snacks in your purse to ensure your child never gets over-hungry when you’re on the go, equipping your child with noise-cancelling headphones in areas where she may experience sensory overload, or adjusting her IEP to include periodic sensory breaks at school. For others, it may be more extreme and require you to create a safe place for your child to retreat to when the world becomes too overwhelming and aggression takes hold. You also may want to have a plan for your other children to keep them safe, and keep a calm down kit in your purse or car so you are prepared when you’re away from home. The idea is to plan ahead so you are prepared and feel more in control when disaster strikes. 4. Opt for positive versus negative reinforcement. Reinforcement is a fabulous technique parents and caregivers can use to improve behavioral issues with autism, and while both positive and negative forms of reinforcement can be effective, research tends to suggest that positive reinforcement – the act of rewarding a child when he completes a desired behavior as a means of increasing the likelihood he’ll repeat the behavior again – is the most effective when it comes to disciplining an autistic child. 5. Be consistent. As parents, we often hear about the importance of being consistent and following through with the consequences we enforce, and as frustrating as it may be when you’re in the heat of the moment and worry you’re doing the wrong thing, remember to trust your judgment. If you falter and fail to follow through, you will confuse your child further, making your efforts to rectify her poor behaviors that much more challenging. 1. Remain neutral. It is especially important to remain calm and neutral when disciplining an autistic child who struggles with verbal communication and/or cannot read nonverbal cues. For example, a child who doesn’t recognize an angry voice from a happy one may take great delight in the change in your tone and repeat the behavior over and over simply to witness this new reaction from you. It’s also important to keep in mind that loud noises can be extremely painful to a child with autism, and while it may seem like raising your voice in anger or frustration drives the point home, your child may be so caught up in trying to cope with the sound of your voice that she’s unable to properly connect it with the behavior she was engaging in before it occurred. 2. Redirect and ignore. Once you know WHY your child is behaving in a certain way, find ways to redirect her to something more positive. For example, if she is pulling your hair to get your attention, teach her to tap you gently on the leg instead. This will take time and patience, but once she understands the concept, ignore the negative behavior (hair pulling) and reward the positive behavior (tapping on the leg). 3. Prepare your child with visual schedules. Visual schedules are great for children who thrive on routine and predictability as it helps set expectations at the beginning of the day, and for children who get ‘stuck’ on and act out in response to schedule changes, it can help prepare them ahead of time. By giving children a visual representation of what their day will look like, you are empowering them by allowing them to look to the visual schedule and move from one activity to the next without prompting, which lessens the chance they will be caught off guard and react poorly. The Easy Daisies Grade 1-7 Classroom Schedule is one of my favorite classroom tools, which can be adapted for use in the home! You can play around with this approach for your individual child, and make it more motivating by awarding stickers each time your child works on an activity or chore he doesn’t like for a certain increment of time, which he can then use to ‘buy’ additional time doing an activity she loves. CLICK HERE for an alternative good behavior chart I created that has proven to be a great parenting tool in our house! …reward your child soon after the desired behavior is completed to establish a connection between the 2 and keep her motivated. …choose a reward that will motivate your child but that you can sustain over time. Additional time watching TV or playing on the iPad, an extra book at bedtime, a trip to the park after school, etc. all work well, but I encourage you against using sweets and monetary rewards as you probably won’t be able to keep those up long-term. …never take stickers away! If a sticker was earned, it is something to be proud of. Do not punish a child by discounting something he or she worked hard to achieve. …never reprimand if a sticker isn’t earned. Instead, spend some time reviewing the goal of the good behavior chart again and be sure to give reminders throughout the day to encourage success. 6. Use ‘obsessions’ to your advantage. Many children with autism have specific interests, and while this can be extremely limiting at times, parents and caregivers can use it to their advantage when trying to figure out how to discipline an autistic child. For example, if your child is extremely interested in trains, create a sticker chart whereby your child earns a train sticker each time a desirable behavior is performed, and once a certain number of stickers are earned, you can take things a step farther by rewarding her with a train toy or an actual trip on a train! Or, if your child is ‘obsessed’ with a certain YouTube channel, allow her to earn additional iPad time (i.e. 10 minutes) for each good behavior she exhibits throughout the day. Blow things out of proportion. Consequences should be natural and logical. For example, implementing additional study time after school is a natural consequence when a child receives a bad grade on a test. Taking away his TV privileges for a month is not. Be consistent and follow through. In order for consequences to work, you must resist the urge to intervene and always follow through! 8. Opt for natural and logical consequences wherever possible. Natural consequences occur inevitably as a result of a child’s behaviors or actions (if your child refuses to eat, she’ll feel hungry) whereas logical consequences require thought and involvement from someone else, such as a parent, teacher, or caregiver, and are designed to help children replace poor behaviors with more appropriate choices (if your child refuses to pick up her toys after being asked, the toys are taken away for a certain period of time). While both kinds of consequences are effective, natural consequences don’t always occur as a result of poor behaviors, making logical consequences an effective strategy to understand and implement when it comes to autism and discipline. Of course, coming up with consequences in the heat of the moment can be challenging, but if you take the time now to anticipate your child’s behaviors and brainstorm natural and logical consequences, you will be much better equipped when disaster strikes! Figuring out how to discipline an autistic child isn’t easy. It takes time, patience, creativity, and a lot of trial and error on the part of parents, caregivers, therapists, and teachers, but once you’re able to determine if the things you are seeing are a result of the autism or just bad behavior, you can figure out ways to anticipate, plan ahead, and correct poor behaviors when they occur. ‘My child isn’t GIVING me a hard time. I hope you’ll keep those words close to your heart the next time your child is acting out, and that you take the time to dive deeper and figure out of it’s the autism or just bad behavior. If you found these tips to teach you how to discipline an autistic child helpful, please share this post on Pinterest! And if you’re looking for more tips for helping kids with autism and sensory processing disorder, please follow our Autism and SPD board, where we share all kinds of helpful information we find each day!